Weren’t we in the grip of winter just a couple of weeks ago? Now the snow is almost gone and birds are migrating in huge numbers, striving to reach vacant nesting territories. The birds are an obvious sign of spring, but there are other, less observed migrations going on as well. I grew up along the Manitowoc River when there was a dam at Rapids. We lived upstream from the dam, a remnant of the old mill operation, and the dam prevented migrating fish from passing. Fish would congregate below the dam and made it a great place to go for smelt and suckers. Sometimes, after supper on one of the first warm days, my grandfather would fire up his little Farmall Cub tractor and hitch up the stone boat to carry waders, nets, and buckets and perhaps a couple of excited grandchildren and go down to the dam. Spring peepers called along the way and woodcock danced. There were a number of people on the banks below the dam already fishing, and more arrived as it became dark. It took some doing to find a good spot to enter and exit the water. Soon there were campfires and the sounds of laughter in the dark. Each dip of the net was a mystery- usually for us yielding just a few smelt. We didn’t keep suckers, although we knew that people canned or pickled them, and we didn’t catch that many. It was fun, though to watch the suckers pretend to be salmon and try to jump at the dam. We didn’t stay out late and by the time we had our little smelt harvest cleaned, I was more than ready for bed. But it was a great experience and about all the excitement we needed. I don’t remember feeling any loss at not watching TV for an evening. Nowadays, the smelt run is not what it used to be. For one thing, the dam has been removed and fish can now migrate wherever they wish. There were also more smelt back then – smelt are not native to the Great Lakes, but were stocked intentionally. They spread around the Lakes, with the population peaking in about 1980, then declining thereafter. There are a lot of reasons for that, fewer sea lampreys killing off larger predatory fish, plankton-filtering mussels, and other reasons. Suckers, of which there are something like 15 species, remain an important forage fish in the Lake and affect not only the ecology of that water body but also the streams into which they migrate. Among the migratory species are longnose and white suckers. They still make spawning runs up those tributaries, although we don’t understand their life histories completely. They move upstream to areas with gravel bottoms to spawn and their fry remain in the stream for a while before moving out into the Lake. The trip can be hard on them, and some of the suckers die, but their bodies then contribute nutrients that feed other animals in the stream, so they take nutrients out of the Lake and distribute them up into neighboring watersheds. This can be an important way of recycling those nutrients. Dr. Karen Murchie of the Shedd Aquarium in Chicago is studying the migration of suckers along the west shore of Lake Michigan. One of our partners, Dr. Titus Seilheimer of UW SeaGrant suggested that Forget Me Not Creek might be an interesting site at which to document sucker migration since it was improved for fish passage last year. We met with Dr. Murchie, and as a result, four volunteers will be visiting the creek to document sucker migration every day starting April 1. 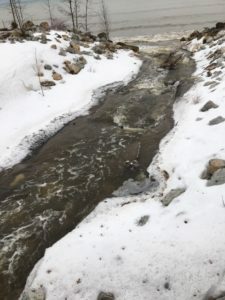 Not only will this give us a chance to look for fish using the creek, but it will give us a reason to visit for a few minutes each day to observe water levels, clarity, and other wildlife that may be using the stream. Dr. Seilheimer and another volunteer will also be monitoring Silver Creek. Spring is a magical time around here. Perhaps that’s a reflection of the many aspects of nature that we don’t fully understand. We welcome the chance to participate in studies like this one which help us appreciate those things which we are still learning. For some of us, it reminds us of childhood experiences in the outdoors and the magic we felt back then.